HomeShort StoriesInspirational StoriesAmazing Short Story – Live in The Present! 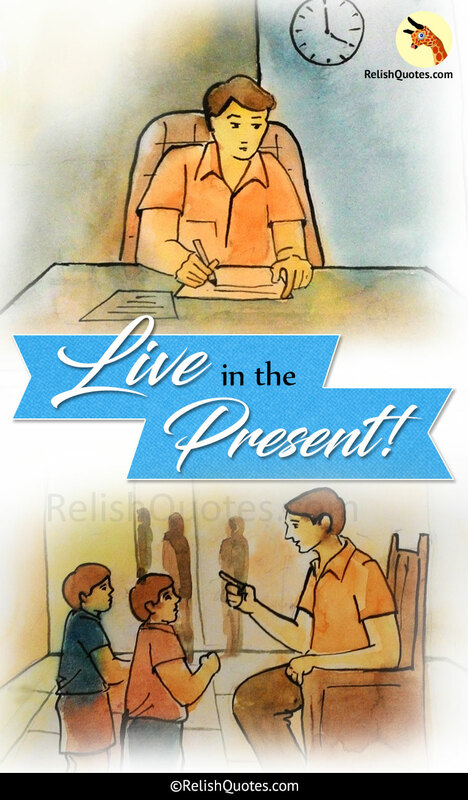 Amazing Short Story – Live in The Present! It was around 5 PM when I was blankly looking at clock waiting for it to pass. I hate waiting and today, it seed like time has decided not to move at all. I was eagerly waiting for my friend Preeth to come to my place with the tickets of watching Oprah. I don’t say I’m a great fan of Oprah but then it was a weekend and we friends had planned that would be our party destination. Only a couple of my friends were actually interested in the show. I was fuming with anger. He had told he’d be there to pick me up by 4, but the clock is showing 5:10 and he still hasn’t arrived. I could not afford to be late as if I missed the first show, the second show was scheduled in the late night and I had to go to office at 8:30 PM for over time work. I was wondering how beautiful my childhood was when I had so less to worry and so much to enjoy. I was jealous of the kids in my apartment who didn’t have work. They had no bosses. They had no deadlines. They had no penalties to bear. They had no over time. No late night jobs. All they had was fun, fun and fun! I came out of my thinking when Preeth had finally arrived. He had got sandwiches to eat in the Car. I told him we could eat them up at home but he refused telling we’d be late for Oprah. I consented and we left my place. We literally gobbled up our sandwiches and rushed to the Oprah theatre. We finally found our seats and other friends of ours. We had nothing more to talk as all of us were colleagues and we’d talk about everything under the sun in our break time in office. We were blankly sitting there waiting for Oprah to start. Besides us was a family of 4, 2 parents and 2 kids. The parents were busy trying to stop their little kids from fighting. The 2 kids were fighting over a dark chocolate. I thought I will watch their show until the Oprah people begun their show! That’s what usually happens right? He He! I watched the kids fighting, while one complained that he has to get a bigger share as he’d just finished his exams and wanted refreshment, the other argued he wanted a bigger piece as he had a football tournament the following day. None of them were ready to sacrifice the bigger part or even settle down for 2 equal pieces. Parents were tired of trying to bring peace to them but they failed miserably. They were fed up and they gave up trying. Their mom said, “Do whatever the hell you want. I’m going to enjoy the show”. Dad was too lazy to even take the pain of telling that he’d given up. The kids continued creating nuisance to everyone who were present in my row. At 7:20 PM the Oprah finally begun. I had already lost the hopes of me enjoying the show as I had to be at my office by 8:30 PM. I needed half an hour to travel, so that leaves me with only 40 minutes of entertainment for the entire week. Even my friends were going through the same frustration. Anyway we told ourselves we’ll at least enjoy 40 minutes of it and then leave and got prepared to enjoy. The Oprah begun but these kids who were fighting didn’t seem like stopping. They continued their fight over the dark chocolate. Both of them were so engrossed in the fight that they forgot they were in an Oprah theatre (not to mention that the tickets are pretty expensive and people die to watch Oprah). They didn’t even listen properly to the songs but were involved in their own petty fight. I was wondering what’s making me concentrate on these kids, I must rather enjoy the show. But then I kept looking at these kids more than enjoying the show. There was something that was bothering me from the inside. When I looked at those kids, I actually felt like I was watching me when I was a 10 year old. I recalled all those moments where my mom and dad used to take me to classical programmes like Yakshagana, Bharatanatyam (These are famous classical art forms in South India if you aren’t familiar). I was least interested in the show and I always had some or the other reason to stay disturbed. It could be fighting with my siblings, thinking about the next day’s competition, thinking about my future exams, thinking about how to hide my low grade drawing sheets from Mom and so on. It’s a paradox! Although I was there in those programmes, I wasn’t there! I mean to say I was just sitting there physically! I never enjoyed the present moment but always thought about future or past events! And today when I look back, none of my scores or sports medals brings me immense happiness. I always regret about how I never lived the happy moments that were given to me by my parents. I regret how big a mistake I had made by not letting my present take over me. I was always occupied by the thoughts of my future life. And today, here I am! I really want to watch the Oprah all night long but unfortunately I cannot as I’ve an office to attend, I’ve works to complete an I’ve deadlines to stick onto. I missed being a kid. Suddenly, I alarmed myself that there’s no point taking a guilt trip now. By regretting about not living in the present in my past is in itself not living in present. So I sat back and enjoyed the show. Though I had only 40 minutes of time I enjoyed every bit of the show. I relaxed myself and watched it like it was the last time I was going to watch it. Before I left, I gave a piece of advice to those kids. I looked into their eyes and told them, “You are just kids now. You’ve got very less things to worry about. Don’t keep quarrelling thinking about the things that’s already happened or yet to happen. Sit back and watch the show. May be you’ll never get an opportunity to watch it so peacefully. Look at me, I really want to watch it but I’ve no time. So kiddos, stop fighting and live the moment. Enjoy the show and learn to live in present”. They smiled at me as I left and bid bye to me. I felt happy for making them realize and I drove to my office.